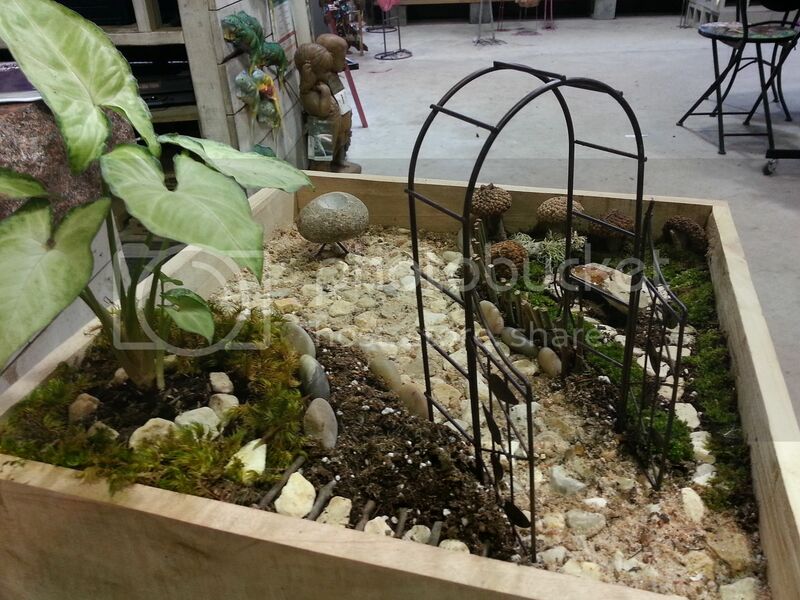 Fairy gardens are miniature gardens for the home or patio. Theses gardens can be planted and completed in a few minutes, a few hours or as a hobby taking months to complete. 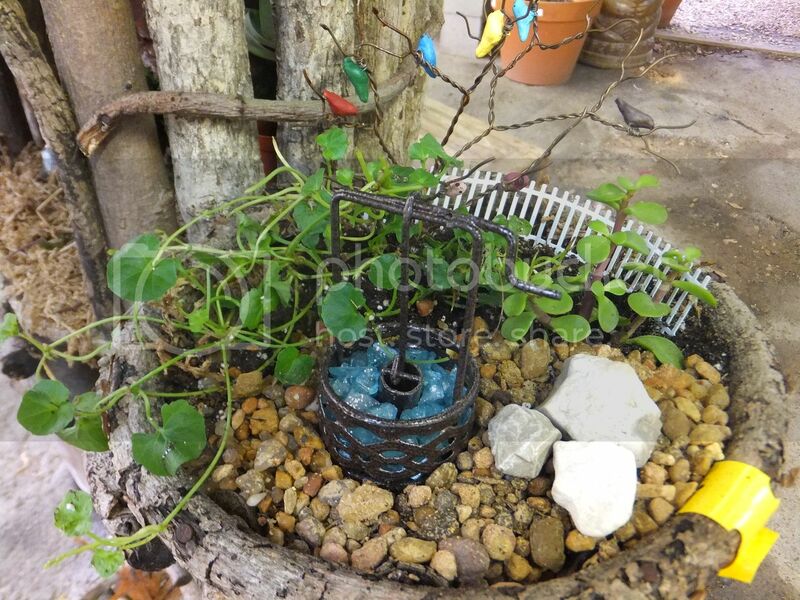 Fairy gardens can be changed seasonally or just on a whim. These miniature gardens are real gardens needing water, light and pruning. Any container can be used for fairy gardening, from a regular standard pot to a broken pot to a red wagon. You can hang them on the wall or use a hanging basket and hang it from a hook; you can even stack your containers. Whatever container you pick to use and however you decide to display it, make sure the container has good drainage. Create one of these scenes or use your imagination to create something totally different. Pick plants with similar water needs, different leaf color, texture, and growing habits. Don’t crowd your plants; allow some room for them to grow. Room is also needed for fences, patios, paths, bridges, homes, stairways, fairies, and/or anything else that completes your fairy garden. When plants get the right size you can pinch them back to keep them the ideal size and shape for your garden. Keep plants trimmed back but if it takes over the container, remove it and replace it with something less vigorous. Miniature gardens need soil and Baccto is a nice light soil for your plants or succulents. Your soil does not have to be level across your container. 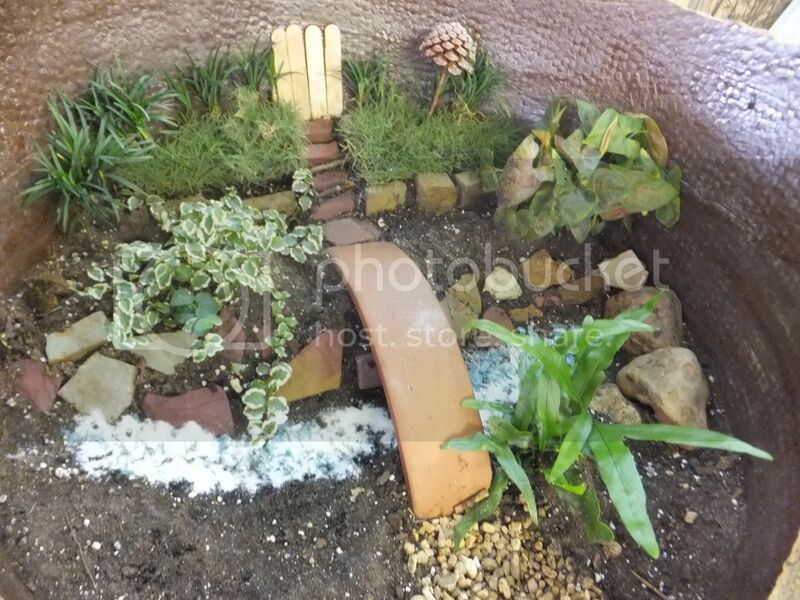 Make hills, valleys, streams, rivers or a beach for interest in your fairy garden. Use rock, pebbles, mulch, sand, moss, tumbled glass, etc. to cover all the soil in your garden. With the soil covered there will be less soil splash when you water. Water your plants as needed. Use your finger to check for dampness. Sometimes the soil may feel damp when it is just cold. Water your garden with a watering can; go very slowly so you don’t disturb your design. Succulents need only water occasionally, allow the soil to completely dry out. making sure they are secure. Push down firmly around each plant and fill in soil around them making sure the roots are completely covered. I find my design develops as I go so I have to be careful when I plant to not disturb my scene. Remember it is all the little details you add that make your fairy garden interesting, unique, and fun. Use found items like acorn caps for making mushrooms, birdbaths or bird nests. Use sticks to make fencing, houses, and doors. Small pieces of flagstone make excellent bridges, patios, retaining walls, cliffs, and paths. Broken pieces of pottery make interesting stepping-stones, garden walls, and bridges. Small Mexican beach pebbles also work well as stepping-stones. Use crushed limestone for paths (make sure your area for the path is level before adding the limestone, just like any big garden). The list of items to use for your fairy garden is only limited by your imagination. Fairy gardening is an excellent way to use your imagination to create the garden you always wanted.